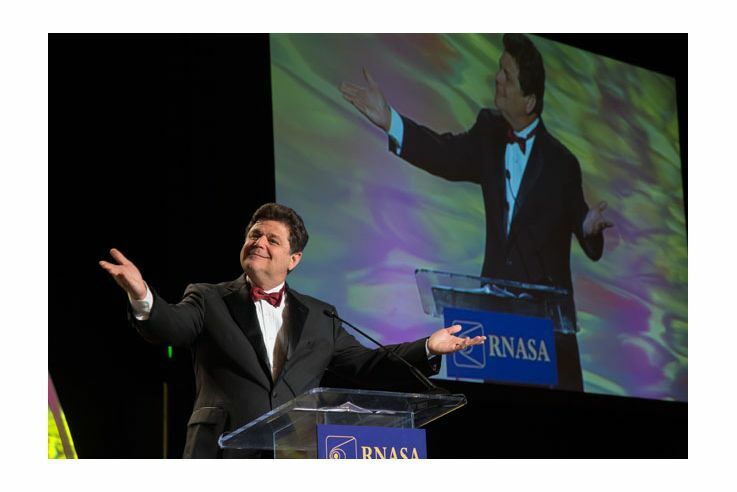 On the evening of April 24, shining stars in the space industry stepped out in their finest for the annual Rotary National Award for Space Achievement (RNASA) Foundation award gala. With former CNN correspondent John Zarella as master of ceremonies, the evening celebrated the nominees, winners and industry as a whole. 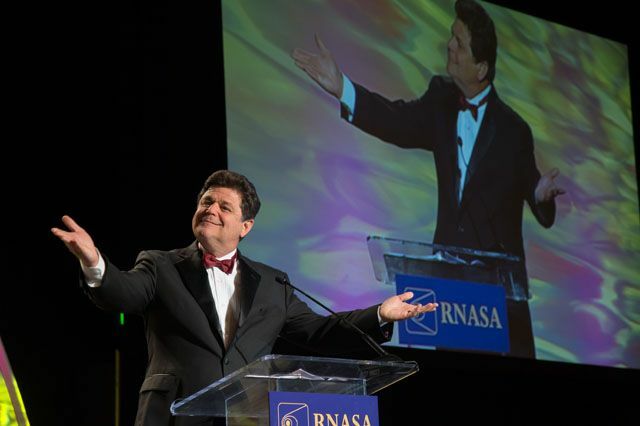 RNASA was founded in 1985 to organize and coordinate an annual event to recognize outstanding achievements in space and create greater public awareness of the benefits of space exploration. Since 1989, the Foundation has presented the National Space Trophy to an outstanding individual who has made major contributions to our nation’s space program. 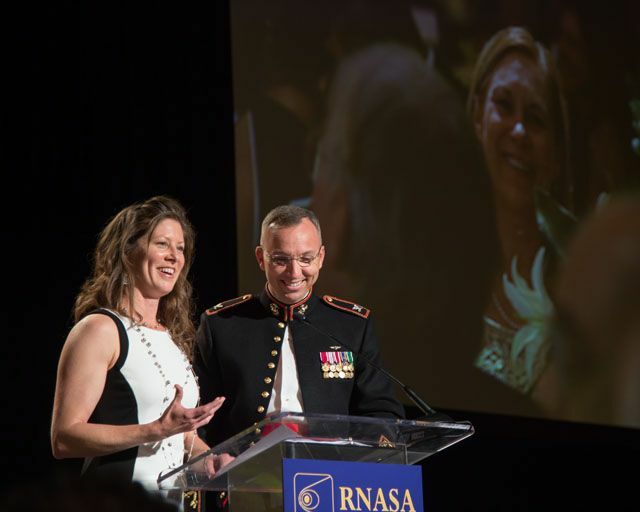 Dr. Ellen Ochoa, Director of the Johnson Space Center, presented this year’s National Space Trophy to Colonel Robert D. Cabana. RNASA also presents the Stellar awards to outstanding individuals in the industry in the Team and Early, Mid and Late career categories. 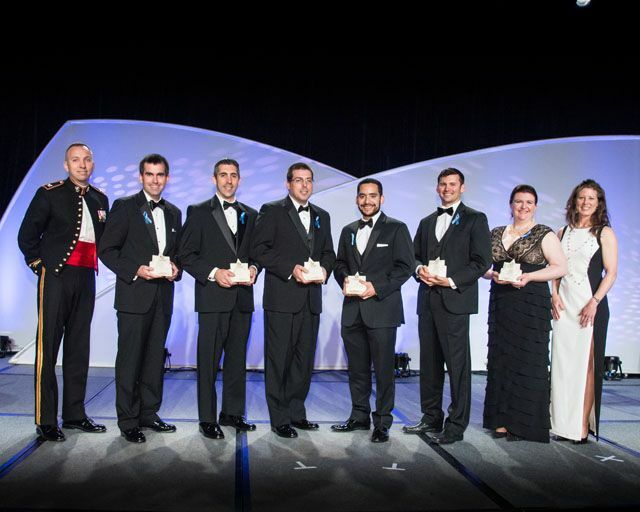 Winners are selected by a Stellar Awards Evaluation Panel based on which accomplishments hold the greatest promise for furthering future activities in space, the extent to which the nominee played a key role in the accomplishment and the extent to which the nominee meets the goal of recognizing "unsung heroes." 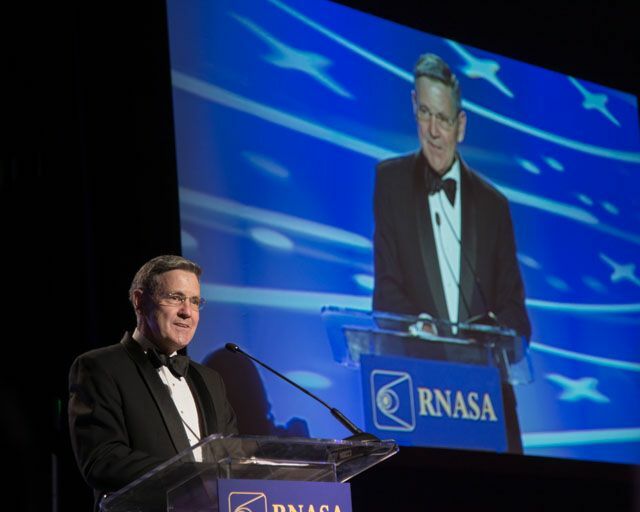 The 2015 Evaluation Panel consisted of former National Space Trophy winners Gen. Kevin P. Chilton (Ret) who is also a member of Orbital ATK’s Board of Directors, Col. Eileen Collins, and Glynn S. Lunney, and former National Associate Administrator for Space Systems Development, Arnold D. Aldrich. The Stellar Award winners each received engraved marble trophies generously sponsored by Orbital ATK. At the banquet, astronauts Tracy Caldwell Dyson and Col. Randy Bresnik announced the winners and presented trophies. Orbital ATK is proud to have had a total of ten individual nominees and four team nominations with three employees taking home awards this year. Melinda Dutton won a Stellar Award in the Early Career category for her efforts on the Space Launch System program. John Jordan and Brian Keller each won Stellar Awards in the Late Career category. Jordan was nominated for his outstanding contributions as Chief Engineer on the Landsat-8 program and Keller was recognized for his efforts as lead engineer for rendezvous/proximity operations for Cygnus. For Dutton, being recognized by the industry she loves is icing on the cake. "I've wanted to work in the space industry since I was a little girl. 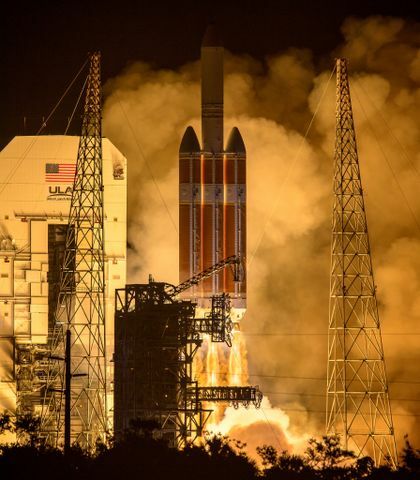 I even went to space camp two times," Dutton said. "I'm so proud to be able to work in the industry I love and to be honored for the work that I get to do for spaceflight is such a huge deal to me." Melinda S. Dutton, recognized for her outstanding work ethic and results-driven focus enabling the resolution and implementation of corrective actions for the asbestos-free insulator replacement of the Space Launch System solid rocket booster. Erin Eichenberg-Bicknell, recognized for extensive accomplishments and deep dedication to key program in Orbital ATK's national security business area. Alex Manka was nominated for significant contributions to the success of the Cygnus Orb-1 mission. Jason J. Robinson, nominated for his exceptional dedication and technical excellence resulting in the successful preparation of the Cygnus mission operations team for commercial resupply missions to the International Space Station. Gordon R. Russell was recognized for his exemplary performance, outstanding leadership, and creation of a model of teamwork, mutual respect, and collaborative innovation in the SLS program office. Todd Wantuch received his nomination for his extensive accomplishments and dedication to the U.S. Air Force Geosynchronous Space Situation Awareness program and mission area. George Dorsey, nominated for his exceptional contributions to the integration of the Cygnus Pressurized Cargo Module within the commercial resupply program. John Jordan was recognized for his outstanding contributions as Orbital Chief Engineer for the highly successful Landsat-8 development. Brian Keller, nominated for his outstanding leadership and technical management as lead engineer for rendezvous/proximity operations for Orbital ATK's Cygnus. 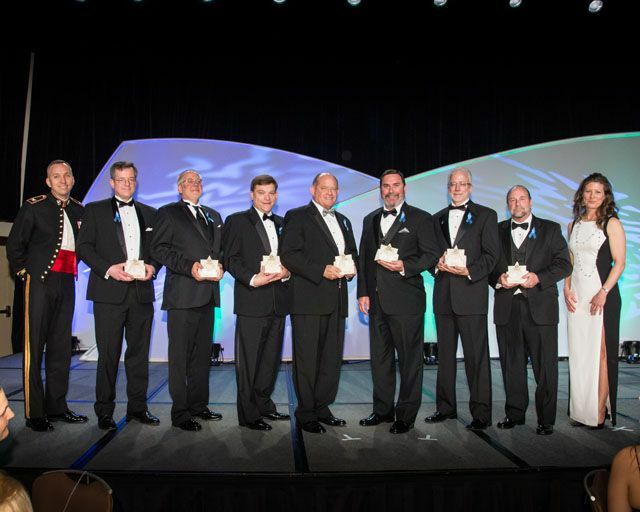 Donald R. Sauvageau received his nomination for exceptional contributions as an industry leader and driving force within the space industry for the advancement of human spaceflight. 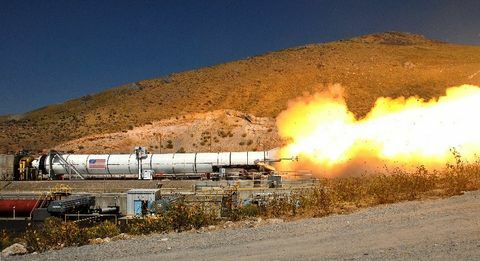 Orbital ATK Space Launch System Forward Skirt-Full Scale Structural Test Team, nominated for outstanding achievement in successfully adding over 35% certification capability to the Solid Rocket Booster heritage forward skirt through innovated testing concepts, saving $35M. 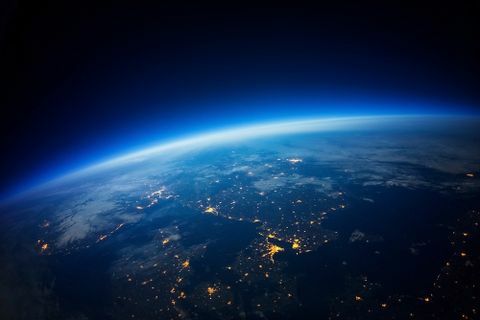 Geosynchronous Space Situational Awareness Program Team, nominated for successful delivery and launch of the Geosynchronous Space Situational Awareness Program, a space neighborhood watch system. Orb-1 Integration and Operations Team, nominated for exceptional dedication and technical excellence resulting in successful integration, processing, launch and operations of the highly successful Orb-1 mission. Orbiting Carbon Observatory 2 (OCO-2) Team, recognized for excellent teamwork in final assembly, test launch and operations of the OCO-2 spacecraft. 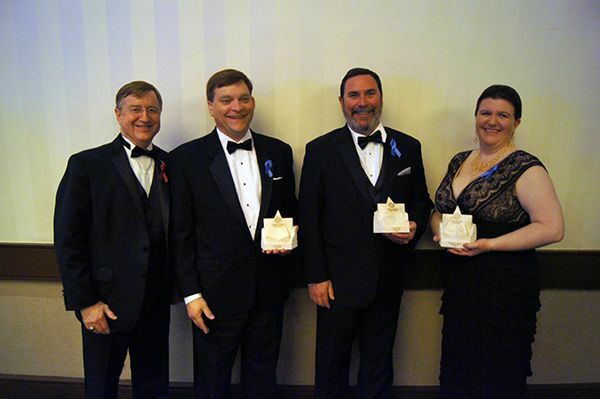 (l-r) Frank Culbertson, President of Orbital ATK's Space Systems Group, Stellar Award winners Brian Keller, John Jordan and Melinda Dutton.